Add valuable storage space where you need it. Project is made from 1x10 pine boards. 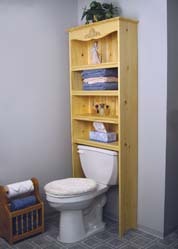 Bottom shelf lifts off for access to toilet tank. Back panel is 1/4” bead board. Plan includes a FULL SIZE pattern for the scrolled top piece. All other parts are drawn TO SCALE. Measures approx. 72”H x 27”W x 10”D. Order embossed birch ornament separately below.